A classic well-fitting bra, lets you feel stylish but still enjoy all day comfort. Interior pockets made of Coolmax moisture wicking fabric keep you comfortable all day long. A minimizing bra with a back smoothing ultra comfortable bonded fabric. The high fabric underarms and in back areas smoothes so you can feel confident that you look your best. Provides a great shape and ultimate support with delicate floral jacquard weave for a feminine touch. Wide, adjustable straps allow for that perfect fit. Featuring: seamless, microfiber pockets and wide straps to relieve tension on your shoulders. A favorite of ours. Seamless Italian Microsense fabric in the pockets make this bra comfortable and breathable. Padded shoulder straps and criss cross embossed jacquard detail this bra. Feminine lace around the cups and thin straps make this a popular bra. Microfibre pockets are ultra soft and breathable for comfort. Added Naturexx fabric finish offers moisture wicking making this a comfortable every day bra! Seasonal color subject to limited availability. Comfortable, supportive, non-wire bra with wide straps. Features feminine lace embroidery over mesh fabric on top of the cup. A favorite in our Support line. Comfortable, supportive, non-wire bra with wide straps. Features feminine lace embroidery over mesh fabric on top of the cup. A favorite in our Support line. Soft camisole bra for extra security and to hug your chest. 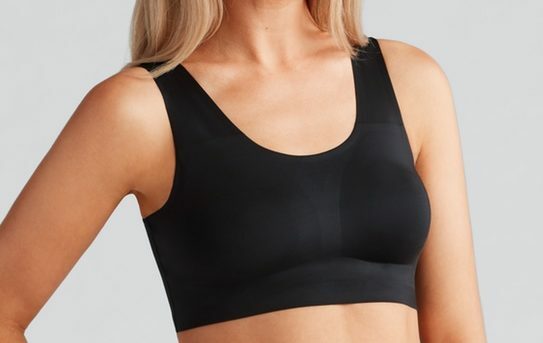 This smooth seamless style with fashion forward front double straps provides an appealing, supportive and flawless appearance.Seamless and moisture-wicking extended Coolmax pockets for comfort and breathability. Beautiful lace bra with average fit. All over scalloped lace with two tone effect. Soft, satiny cups. Lightly fiber filled for good shaping and additional support. Soft, stretchy and comfortable! They are all seamless, so no hooks or clasps. The back is smooth. Features adjustable straps. Soft, stretchy and comfortable! They are all seamless, so no hooks or clasps. The back is smooth. Features a v-neck with lace and adjustable straps. his super comfortable bra features extra wide, fixed straps. Also has removable pads. High quality lace trim around the neck line and around the bottom band. Fits a bit “snugger” then the plain version. This amazingly comfortable bra features extra wide, fixed straps. Made of the same extremely comfortable, stretchy fabric as the original Coobie Seamless Bra. A beautiful lace panel across the front provides a perfect cover up. Features adjustable straps and removable pads. If you want the comfort of our Scoopneck but a little more coverage then this is the one for you. Phased out, some stock remaining. This is a full cup fit with few seams. Features breathable fabric cups for moisture wicking.